Only Parent Chronicles: Share a Spoon - Yes, I'm Polish. So What? Share a Spoon - Yes, I'm Polish. So What? not having linked to this week's Share a Spoon. always been a great party treat. Being the only entertaining I am doing is for my son's 12th bday tonight, I found an image via Google. Brown your ground meats and drain the grease. Mix in onion, garlic powder, cubed Velveeta, and Worchestershire until smooth. Spread onto cocktail rye and place on a cookie sheet. 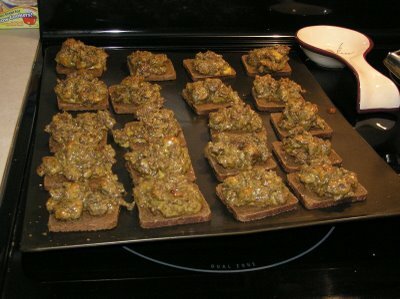 Place cookie sheet into preheated broiler and broil until the spread is just browned. Polish food rocks! I'll have to try this one! They sound delicious. Thank you. This sounds super yummy! I love easy for party food and this anyone can do right? Right!!! Thanks for Sharing! *sheepish grin* Sorry about the call out. I was desperate! Ooh, my mom makes a dish likes this, but it has an inapropriate name! I have an award for you over at my blog! Come grab it!